MEXICO CITY (AP) A season that started so well for Sebastian Vettel and Ferrari will end with Lewis Hamilton and Mercedes crowned as Formula One champions. Hamilton won his fourth career championship Sunday with his ninth-place finish at the Mexican Grand Prix. As usual, Ferrari was right there at the start and even had the pace to beat Hamilton, only to have something go wrong. In previous races it was a crash or engine failure. On Sunday, it was Vettel’s bump with Hamilton that damaged both cars and forced both to quickly pit for repairs. 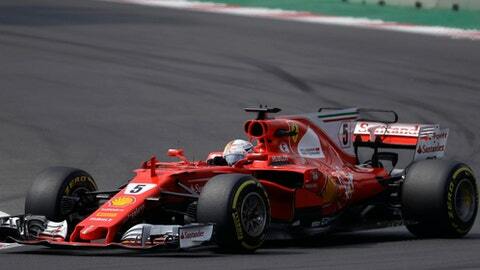 The damage put Vettel on a failed chase to push the championship to the next race in Brazil. The disappointment of this season may have Ferrari fans seeing red, both with anger and some embarrassment. Ferrari hasn’t won a driver’s championship since Kimi Raikkonen in 2007. It looked as if this might be the year for breaking that drought when Vettel stormed to three wins and three second-place finishes in the first six races, including a win at Monaco, the crown jewel of the season. With its red cars rolling, Ferrari was finally giving Formula One the title fight its fans had been craving. It wouldn’t last. Ferrari’s title hopes were curtailed by engine issues and a crash in Singapore that was caused by Vettel almost immediately after the start. Ferrari’s fortunes changed with that wreck. Hamilton, who had just hoped to limit his damage that day, seized on the chance and won. He has been looking back at Vettel and the rest of the field ever since. Vettel, himself a four-time champion, has started in pole position four times, including Sunday, and come away with just one win in Hungary. At the U.S. Grand Prix, Vettel grabbed the early lead but was quickly hunted down by Hamilton, who passed him without a fight. ”I don’t fear him. I like racing with him. I would have liked a little bit more of that this season. But overall (Mercedes) were the better bunch,” Vettel said. All that’s left now is to push for race wins in Brazil and Abu Dhabi to launch Ferrari into next season. Mercedes’ Nico Rosberg did it in 2015. After Hamilton clinched the championship at the U.S. Grand Prix that season, Rosberg won the final three races and burst into 2016 with four more victories on his way to the season title. As for the constructor’s championship, Mercedes wrapped that up in Texas despite Ferrari getting two cars on the podium that day. ”I have to say I saw many positives this year,” Ferrari Team Principle Maurizio Arrivabene said before the Mexican Grand Prix. He predicted it won’t take much to get Ferrari back on top. Hamilton would embrace another faceoff with Ferrari. After battling Rosberg the previous three seasons in a rivalry that split a childhood friendship and created tension within Mercedes’ garage, racing against Ferrari was fun, according to Hamilton. He’d like to do it again. Ferrari just has to keep up. And in the rearview mirror.